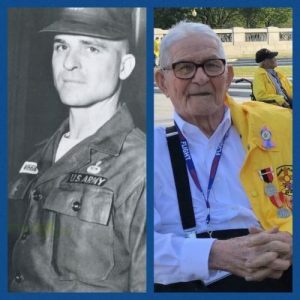 World War II Combat Veteran, Army Airborne Master Sergeant (RET) Thomas W. Wiggins was called by The Lord on a beautiful spring day, Sunday, March 24th, 2019, and released from his earthly bonds after 95 years. Born 1923 in Millen, Ga, he was the son of an “influential sharecropper” raised by honorable hard working God fearing parents, Thomas & Ada, with two brothers, CP and Ashley and three sisters, Edna, Norma and Iris, in a southern rural area where you went to school on Monday but got time off for the harvesting of crops. When he enlisted in the U S Army in 1943 his occupation was listed as “Field Hand” and home of record a simple Rt 2, Lyons, Ga. He was assigned to the 511th Airborne Signal Company and survived combat missions in New Guinea, Southern Philippines and Luzon. His medals included American Service Medal, World War II Victory Medal, Asiatic-Pacific Service Medal with 3 Bronze Stars, Philippine Liberation Ribbon with 2 Bronze Stars, Good Conduct Medal, AR 600-69, Bronze Arrowhead, Distinguished Unit Badge, and was part of the Japan Occupation Forces. Lather he was re-assigned to A Btry S&P Bn Sch Spt Command USSAACS Ft Bliss, TX 4th USA, as an Air Defense Missile and Radar systems Instructor, 16B5h Hercules Missile Crmn. He retired at Ft Bliss TX with over 20 years of Military Service and 20 years in the Civil Service. On October5,6,7, 2017 he was selected for the 10th Annual Southern New Mexico Honor Flight to Washington D.C. He was escorted by his youngest son, Michael. This turned out to be Michael’s last brave gesture of honor to his father having lost his own life to cancer only three months later. After retirement he founded the family Ballroom Dance School, Dance Whirl USA, in 1988, and spent the next 10 years enjoying the life as a ballroom dancer, winning awards in dance competitions from San Antonio to San Diego and enjoying the travel and parties and friendships along the way. I’m sure he never imagined that would happen but the love of his life “My Pretty Wife” talked him into it. He was blessed with a long life and the company of his wife, sons and many friends. His neighbor of over 4 decades commented, “They don’t make neighbors like him anymore.” His mission as a caring responsible son, loving and helpful brother, brave and steadfast soldier, committed father and faithful loving husband was judged to be completed after his wife of 70 years, Margaret Lillian Wiggins passed away last September. He prayed on Thursday and God gave him his rest and his reward on Sunday. He is survived by two sons and daughter in-law’s, David, Thomas 3rd (Elizabeth), (Naomi), his sister, Iris, three grand kids (Kimberly, Alexa and Jake) hundreds of relatives all over the country who love and adore him for being the honorable, kind, sweet, caring and happy man that he was. Special Thanks to St Teresa Nursing & Rehab Facility, Casa Primavera Foster Home & AM Hospice for the excellent compassionate care they provided.